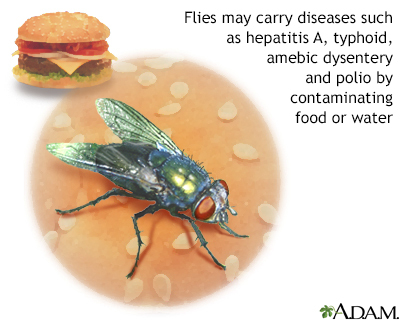 A fly may act as a mechanical vector of diseases such as Hepatitis A, which means the fly carries the infective organism on its feet or mouth parts and contaminates food or water which a person then consumes. A biological vector actually develops an infective organism in its body and passes it along to its host, usually through its saliva. A fly can be a biological vector, as in the transmission of leishmaniasis by the sandfly.